Just like rotation w/in the circle of life (fixed income, FX, commodities and equities) it also occurs w/in the context of our markets. The S&P 500 has different weights given to different sectors. 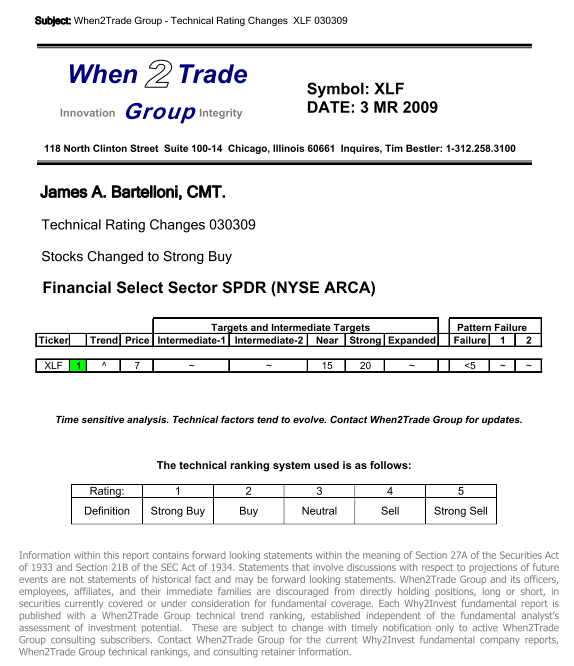 Take for instance, the financials (and of course the topic of this post) – in 2009 they made up only 8% of the index. Now, in 2013 they are almost 17% of the index. Technology, is the largest component of the index at 17-18% and it has stayed that way from 2009-2013. So, the banks have, essentially, doubled their exposure w/in this index and are, pretty much, the largest portion of the S&P. So … what have we been following w/ this sector over the past years ….? in 2007, as the market was exploding higher, I again started to see some disturbing signs. The parabolic move in housing, the corresponding parabolic move in oil (which as the time made up 15% of the index and is now around 10) all showed that the sector rotation playbook was in full affect. That is, the banks will, historically lead us UP and start us DOWN – BUT – ENERGY will be the last to go. 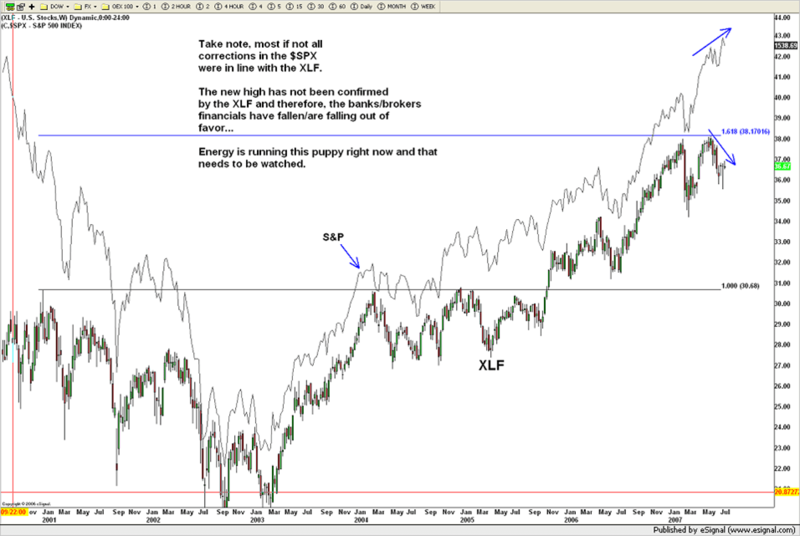 So, our first chart shows the sell pattern completing in the banks as the we came into the historical 2007 time frame. Couple things to take away — 1) the sell pattern worked but in the context of the S&P, which continued to go higher, we had to shift our focus to energy and look for that top to come in before the general market would start down. I presented this analysis to the multiple institutions that I was working w/ and for at the time and nobody wanted to hear it or pay attention to it. The rest is, of course, history ….that pattern was extremely powerful and the financial industry collapsed. Note the date – March 03 2009. “Trading Blind” correct? 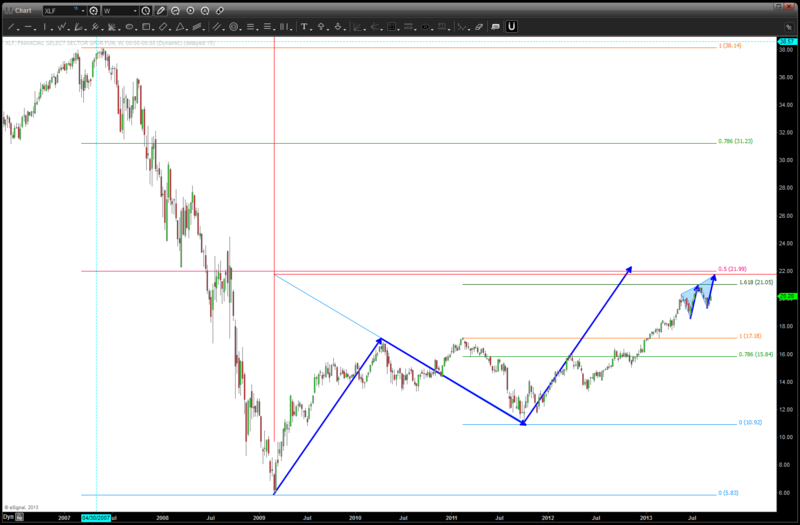 Looks like a “blind squirrel found an acorn” again ….well, here’s what I saw and why the BUY PATTERN was so powerful. 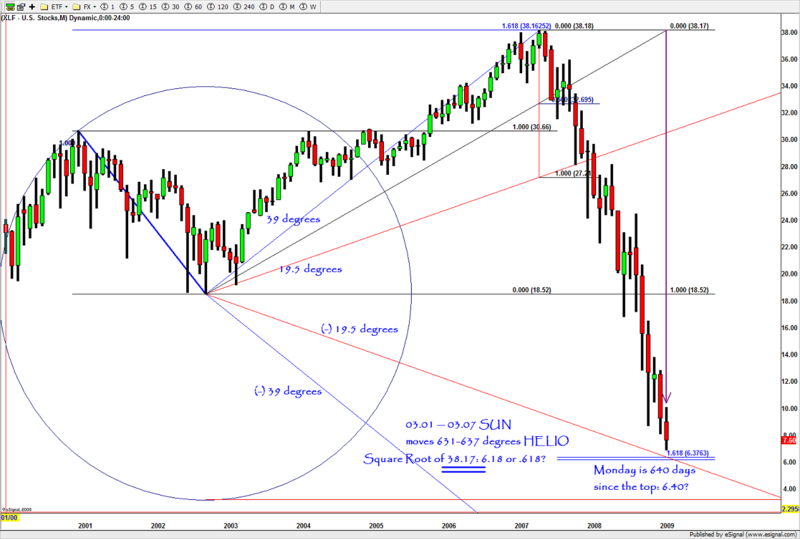 Spend some time studying if you want, or not, but the pattern was there and as a pattern recognition trader — what the heck, had to give it a shot.